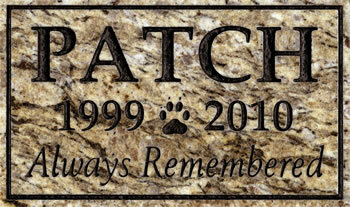 This granite memorial is made of the finest quality American granite, quarried from the hills of South Carolina. Made in USA. A paw print divides the dates. Standard: 10" W x 6" H x 1.25" D. Weight: 8 lbs. Large: 15" W x 7" H x 1.25" D. Weight: 16 lbs. 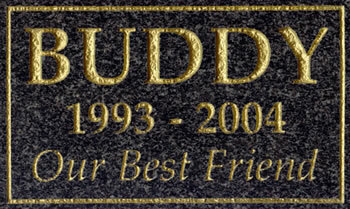 Duffy's tombstone arrived today, and it's exactly what I wanted (and was very well packaged). Thank you for the excellent customer service to track down this matching granite stone for us. Beautiful. Plus, in North Dakota weather, it'll last.